Recent debates about sustainable development have shifted their focus from fixing environmental problems in a technocratic and economic way to more fundamental changes in social-political processes and relations. In this context, participation is a genuinely transformative approach to sustainable development, yet the process by which participation leads to transformation is not sufficiently understood. 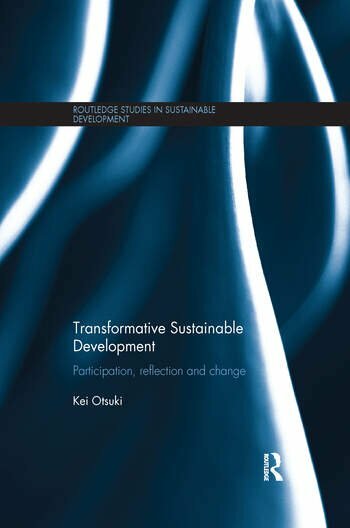 This book considers how the act of participating in sustainable development projects can bring about social transformation that is considered to be fair and just by the participants and non-participants in a broader societal context. Drawing on ideas from social theory and applied anthropology, the book proposes a reflexivity-based framework to analyse participation as a type of social action underpinned by primary experience. Development projects have a transformative effect when participants are given the opportunity to reflect on their experience, share the reflection with others, and open new space for collective deliberation and change. The book applies this framework to assess community-based participatory projects in the Amazon, African slums and rural settlements, and disaster stricken areas in Japan. It also outlines potential institutions of governance to institutionalize the change by referring to current food governance, drawing out lessons with international relevance. This book will be of interest to students of sustainable development, environmental policy and development studies, as well as practitioners and policy-makers in these fields. Kei Otsuki is a sociologist and a researcher currently affiliated with the United Nations University, Institute for the Advanced Study of Sustainability, Japan.